Paperboys and girls symbolize our country's relentless, indefatigable entrepreneurial spirit. They bought, sold, and delivered papers. And they did it alone, often in the dark and cold-and they were kids! In this witty and wise story, bestselling business author Jeffrey J. Fox reveals why the lessons paperboys learn so often establish them on the early road to success. The story follows a young New England paperboy named Rain, as he navigates the business of being in business and quickly becomes the best paperboy in town. 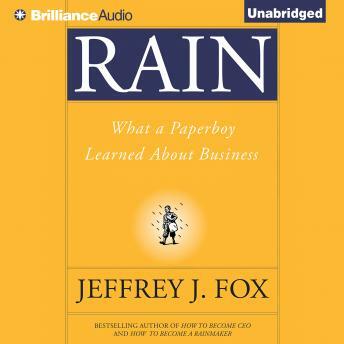 Through a series of humorous and often poignant vignettes, Fox illustrates "rainmaker" business lessons that can be applied not only to paperboys, but to anyone in business and sales facing obstacles and challenges. While working his paper route, Rain gradually discovers the value of planning for an interview, the ten customer commandments, his ability to negotiate, why it's necessary to innovate, how to create an exit strategy, and much more. Ultimately, Rain's time as a paperboy proves to be a valuable foundation for business success. Rain includes "The Rain Reader," a series of actionable business takeaways and practical advice to make anyone a rainmaker.